I personally have done Smolov Jr for the first time in April 2016. Within a month, I was able to add 10kg to my bench press moving the needle from 140kg to 150kg at 86kg - 88kg bodyweight at the time. The program is easy to follow and you see my stats above. If you want to run it yourself you will find an excel spreadsheet at the end of this post to print and take to the gym. Smolov Jr will last for a month. It is a subpart out of the longer three month Smolov program. One of the less aggressive cycles has been taken out so that you can run a focused approach for one of your lifts on which you are currently trying to break through a plateau. As such it is not a good program to develop a well-rounded performance for powerlifters who want to excel at a meet. If you are optimizing for a meet, maybe consider this program off-season, when one of your lifts is costing you the gold medal or the place on the pedestal, because it lags behind your other two lifts. Suitable lifts, in my opinion, to run on this template are the squat, bench press, military press, and push press. If you wanted to do deadlifts or Olympic lifts on this program, be aware that these lifts are usually done at low volume and high load in every other program. Smolov Jr is high volume / high and therefore the injury risk would be quite high if you were to do a deadlift or Olympic lift Smolov Jr cycle. You have been warned. You will train four times a week. Monday, Wednesday, Friday, and Saturday are training days. Tuesday and Thursday are off days. On Monday you will do 6x6 @ 70% followed by 7x5 @ 75%, 8x4 @ 80% and 10x3 @ 85%. All the percentages are calculated from your one repetition maximum. In week two you will add 5kg to all the lifts. In week 3 10kg. Week 4 is a rest and test week. Smolov Jr works in the range of six to three repetition per set. You will do 36, 35, 32 and 30 repetitions during one week. While the number of repetitions decreases, the load increases. Based on this it is in the optimal range in terms of repetitions per set according to the Prilepin chart but above the recommendations in terms of total range. This means that it is a quite challenging program if you get your one repetition maximum right. If you are unsure about your 1RM or work with an outdated one that has not been tested for a while, either cut 10-15% off it or retest it. In total, you will add 399 repetitions of the lift of your choice to your experience during a Smolov Jr. cycle in one month. This number varies greatly based on your lifting level. In my example, I added 45 tons of bench pressing in a month or somewhere between 3t - 4t per session. I personally would recommend warming up very well when on Smolov Jr. I usually do the Franco Agile 8 routine which is recommended by Jim Wendler. In addition, if you were to choose the bench press or military press for your cycle, i think it is good advice to add some arm cycles and shoulder stretches to keep everything smooth. If you do not have a bench press maximum north of 100kg, adjust accordingly. If you are Ed Coan, Kirill, or the Mountain, do likewise. Still Smolov Jr is a program for intermediates. If you can not bench/squat your own bodyweight yet, please consider Stronglifts 5x5 or starting strength instead and stay away from Smolov. I do this warm up without rest. Just swap the plates and get going. Once done, wait for 2 minutes to start with you first set. Is Smolov Jr hard ? Yes, it is. This program is not for the faint-hearted. If you are sick or slightly injured, consider a different program until you are better. Only do it in your best form. For me personally, I decided to go for a Smolov Jr for bench press because I had a lower back problem after running Wendler 531 for eight months. For this purpose it was ideal and I am following up with a full smolov squat round. How much does Smolov Jr add to your one repetition maximum ? In my case, I can only speak about the bench press in particular. I managed to bring my bench up from 140kg to 150kg in a month. This is a very good result in my opinion and is just as much as the program claims to add within that timeframe. If you are running the Smolov Jr template for the bench press, definitely consider getting a Mark Bell Slingshot to get the most out of it. I started to fail the last few sets in the second week. I used the Slingshot to get all of my sets in at full rep count. If I had to use the Slingcompensatednesated on the last set for the "cheating" utilising this accessory by changing the last set to an AMRAP set. The other option is to scale down the load when you start to fail, if you do not have a sling shot. Smolov Jr is a focused, solid program which does what it says on the tin for intermediate to advanced lifters. Ideally suited for pushing through a plateau off season for professionals or a test of manliness for non competing lifters. Beginners should stay away. 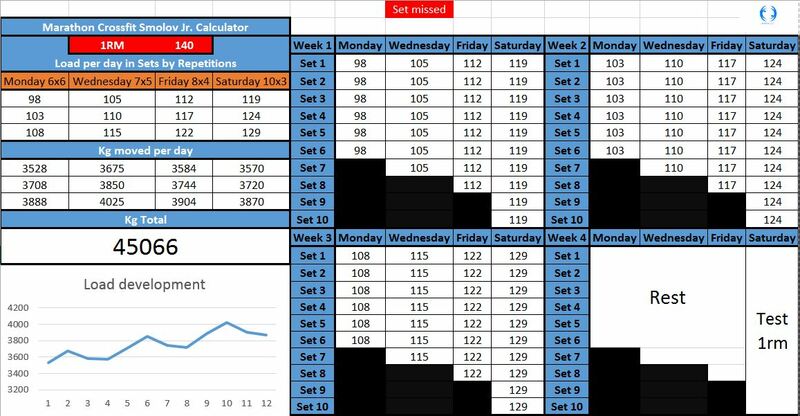 If you want to have a go at the program you can click below to get an excel spreadhseet in which you only have to provide your one repetition maximum and the rest is calculated for you. It is optimised for print on an A4 landscape piece of paper to be taken to the gym.